Situated close to the Brisbane River and CBD, the thoughtfully planned and beautifully appointed West End apartments are designed to maximise their surrounds. The new apartments are designed with first-class living and convenience that provides every resident with the home of their dreams. Citro’s new apartment developments in Brisbane offer a fresh, exciting and urban sanctuary featuring a variety of 1 and 2 bedroom apartments. You can also enjoy stunning city views on Citro’s rooftop terrace including a pool, outdoor cinema, BBQ and dining areas. Citro’s Brand new display apartment is ready for viewing. Book an exclusive viewing today! Live the high life with Citro’s sky garden. 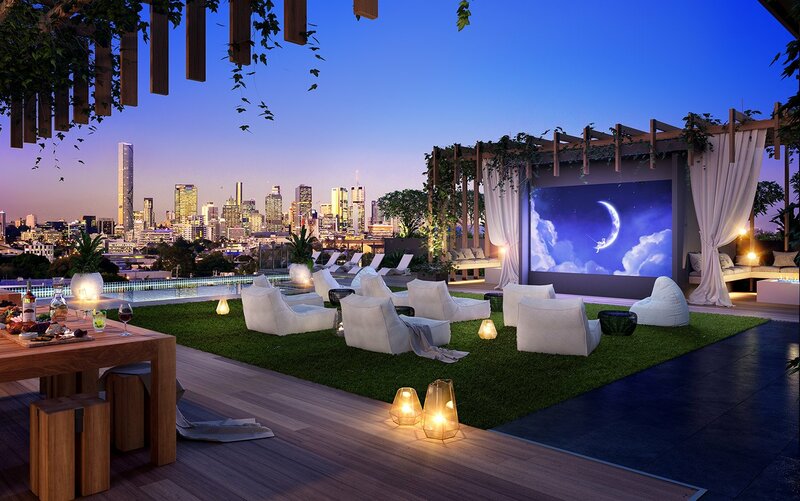 Residents can take advantage of the rooftop pool, outdoor cinema, BBQ and dining area, all whilst enjoying city views. You can also invite your family or friends to see a spectacular view of the sunset or the Brisbane River. It’s the perfect place to entertain guests or unwind at the end of the day. Our West End apartments in Brisbane are strategically located in the centre of Brisbane’s most liveable city suburb. Residents will find it easy to get around town with the many transport options such as buses, bikes and trains. South Bank and South Brisbane are the nearest train stations where residents can travel to QLD and beyond. Living in one of our West End apartments introduces you to a vibrant lifestyle with a mix of modern and vintage cultures to discover. Explore what’s in store for you at the local shopping centres and tickle your taste buds at the various restaurants and cafés to experience Brisbane’s colourful and exciting lifestyle. If you’re a first time home buyer or need some extra help, we’ve sourced some helpful documents and websites that assist you in buying a brand new Citro West End apartment in Brisbane. With the help of the QLD First Home Owners’ Grant, you can receive up to $15,000 to purchase or build your new home. Inner urban living has never looked so bright.